This week we are sharing a photo by Indo-Swiss street photographer Suresh Naganathan. Suresh is currently based in Mumbai, India. As an artist he aims to show the connections between people and their surroundings and his connection as a photographer with his subjects. Suresh is work is highly interesting. As I see it, he goes for surreal moments, awkward situations, humorous concepts and has an eye that can see things other people can’t. Even though I don’t know him personally, I am pretty sure that when he is out and about, he zones in and sees everything in slow motion, giving him the power to “predict” the unfolding of events. That is a talent that you either have or don’t. There isn’t much information readily available about Suresh online, but we did manage to discover some links for you. You can see more of Suresh Naganathan’s photographic work on his Flickr account at https://www.flickr.com/photos/bek_the_sur/, his Lensculture.com profile at https://www.lensculture.com/suresh-naganathan, his National Geograpic page at http://yourshot.nationalgeographic.com/profile/684099/ or his facebook profile at https://www.facebook.com/suresh.naganathan.37. This photograph is so perfect I feel that by explaining what we are seeing here is overkill, but I will do so anyhow because I enjoy it so much. Suresh used that talent of his I was referring to before – call it his ‘sixth sense’ – to predict an almost graphically designed, poster ad photo. You might not understand what I mean by that so I will elaborate. 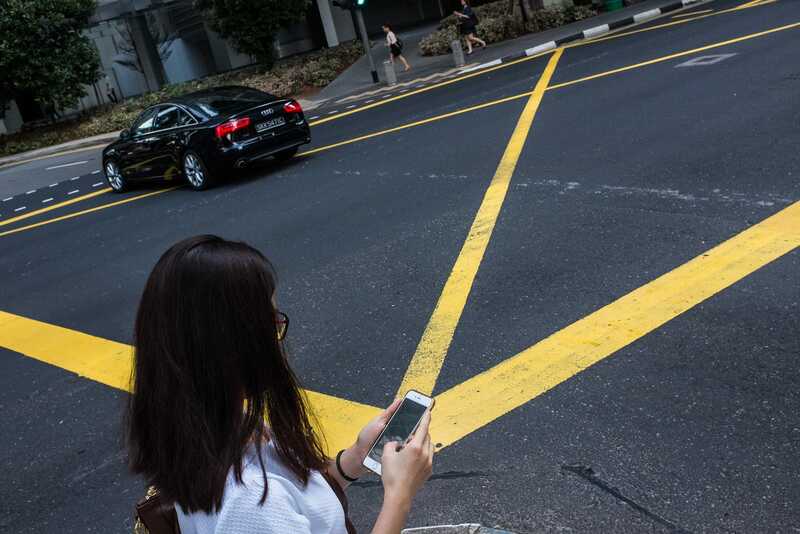 The woman has walked into the spot where the ends of the 3 yellow lines meet. Her position gives the impression that the 3 lines are exploding out of her phone, something that a graphic designer might have designed for a poster advert. Maybe my mind works in mysterious ways because of my graphic design background, but that is what I think about when I see this photograph. 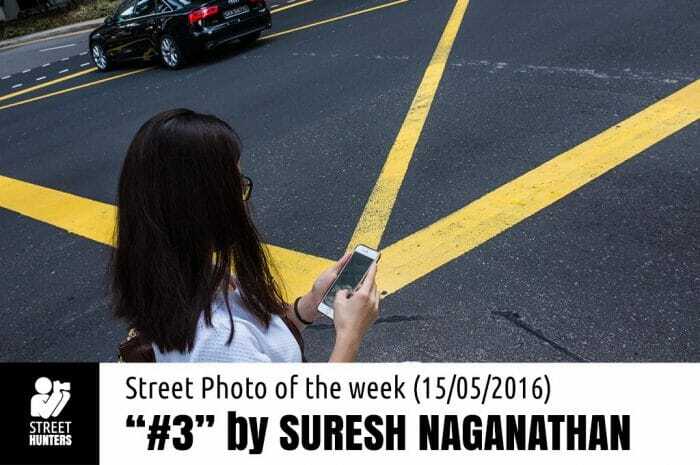 By tilting the camera to the right, Suresh has managed to give the photo dynamism, as if there is a sense of motion or power radiating from the phone via the yellow lines. Also, the colour of the street, being dark grey, has helped to emphasise what he is going for even more because it helps make the yellow pop. I love that he placed the woman in the bottom left corner too, it adds to the dynamism I referred to before because it makes us feel that she is going somewhere and she isn’t static, as if she walked into the photo and yellow rays exploded from her phone. Terrific photograph! Nice picture indeed perfect timing with Yellow strips..Good work..